*Uses an average 150 day gestation period for a Goat. Goat gestation periods can generally be anywhere from 145-155 days. The Goat Pregnancy Calculator (sometimes called a ‘Goat Kidding Calculator’ is a much simpler process to use than the often-used Goat Gestation Chart. Without a calculator or chart you had to count the days until your Goat’s due date. Female goats are referred to as ‘does’ or ‘nannies’. Twins are the standard, but single and triplet births are also very common. A male goat is called a buck. A female goat is called a doe. A doe generally comes into heat every 21 days for 2-48 hours. 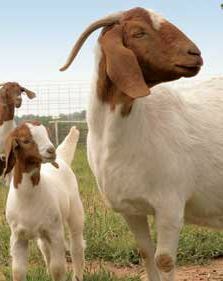 Goats reach puberty age between 3 and 15 months of age depending on nutrition and breed. GestationCalculator.com is providing this Goat pregnancy calculator as a service. It helps visitors answer the question ‘How Long is a Goat Pregnant?’. It’s important that you enter the 1st day a Goat is bred for it to work. Some goat farmers will find this tool very helpful, so remember to bookmark it. Also, try using any of our other gestation calculators just for fun! We even have a gestation calculator for an Asian Elephant! Please direct any questions you may have to askabreeder@gmail.com. The Gestation Period for a Goat is approximately 145-155 days from the first breeding until the goat is born. A goat can conceive after one mating. The Goat Gestation Period Calculator above attempts to generalize the estimation of the due date without any additional factors using a 150 day gestation period for a goat. Did you know goats are among the earliest animals to be domesticated. There are nearly 1 billion goats on the planet today.